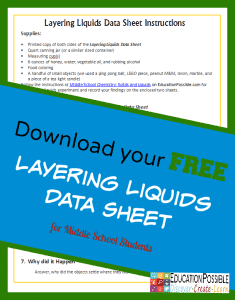 If your middle schoolers are studying chemistry, then this free printable Layering Liquids Data Sheet may be a helpful addition to your homeschool. Layering Liquids experiment included in post. DOWNLOAD YOUR FREE CHEMISTRY PRINTABLE NOW.